Are you all sitty comfty-bold two-square on your botty? Then I’ll begin. Once upon a time, there was a game company called Spectrum HoloByte. The product lines that this company developed and published are written in the annals of history: Falcon, Tetris, Star Trek: The Next Generation. Spectrum HoloByte was then lead by a benevolent ruler, who we shall call Gilman. One day, in a bit of overexuberance for which charismatic leaders are known, Gilman announced that his company, with its teams of (necessarily underpaid) game developers, would create the strongest chess program ever. With that decision, the great challenge began. 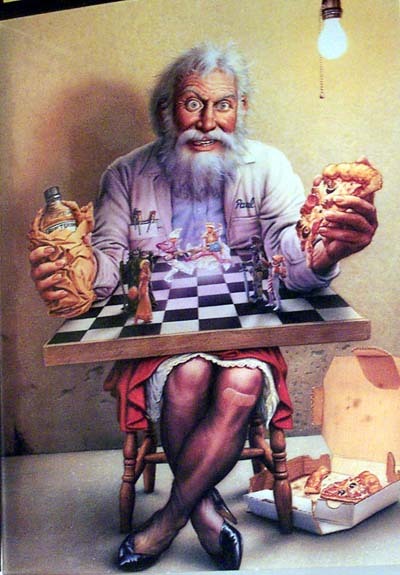 Soon, Gilman learned that which so many before him had also realized: chess programming is resilient to good intentions and extra resources. He eventually had to admit defeat, but like any good leader, he had an alternative plan. Rather than simply kill the project, Spectrum HoloByte would instead create the funniest chess program ever. Everything seemed to be going fairly smoothly, if slowly, for the chess game. Then one day during beta testing, a new Senior Software Engineer in the PC Group noticed that the chess being played was particularly poor. I… I mean, he… had done some basic chess programming, so he used his simple program from 5 years earlier and it played against the new game’s highest level and won! This was clearly not right. Fortunately, one of the wizards of the kingdom, who we shall call Erick, came to the rescue of the product in distress and saved the day. (If you must know, there was a serious bug in the handling of the hash tables. When fixed, the game crushed the old program, as it rightly should.) As with any good fairy tale, the victory was just in time, as the boxes were already printed, and the disk duplication had to commence at once. Alas, this is where the story takes an unexpected turn and reveals the true conflict. 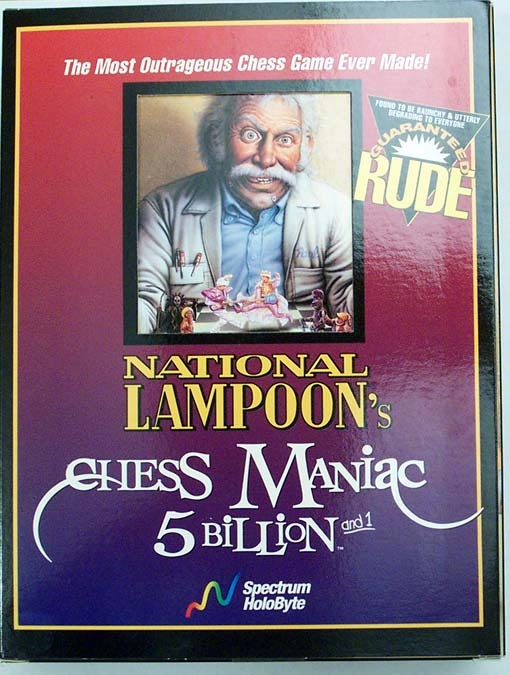 After some 30,000 boxes had been printed for National Lampoon’s ChessMeister 5 Billion and 1, a lawyer informed the producer (and, apparently, everybody else who would take his calls) that the name violated the trademark of their client, whose product was not the strongest chess program, nor the funniest, but perhaps it was the market leader. Perhaps, too, that was why it was the target of the parody. The test for determining a trademark violation is possibility of confusion. 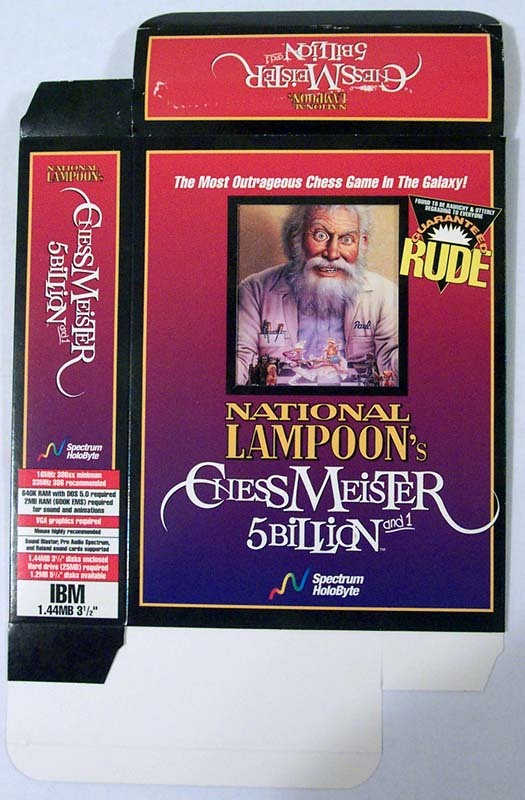 Perhaps the “ChessMeister” part sounded a little similar to some portion of the other name, but the “National Lampoon’s … 5 Billion and 1” part (fully 70% of the name) was unique. There is also a principal known as fair use that covers parody, but the lawyer was kind[sic] enough to provide case law citations to indicate that this may not apply to commercial speech. Spectrum HoloByte relented and agreed to change the name. Having forced retreat, the lawyer advanced further. Not only was the name a violation, so was the image of the crazy old man with a white beard (because, apparently, nobody had ever seen one of those before). The rumor was that the image used for the other product was modeled after somebody’s grandfather, so they took this as a personal insult. So, the old man had to shave, but that was not all. He also had to lose the “Blisterine” he swilled because, somehow, a company had associated their trademark with it after magically discovering the contents of the inside box artwork for a game that had not yet been released. After a tough week, Paul, our ChessMeister turned Chess Maniac, shaved his beard, sustaining a cut to his chin, and took to some unidentified purple liquid. (He did resort to a bottle of some disgusting pink stuff, but that, too, was taken from him for legal reasons.) 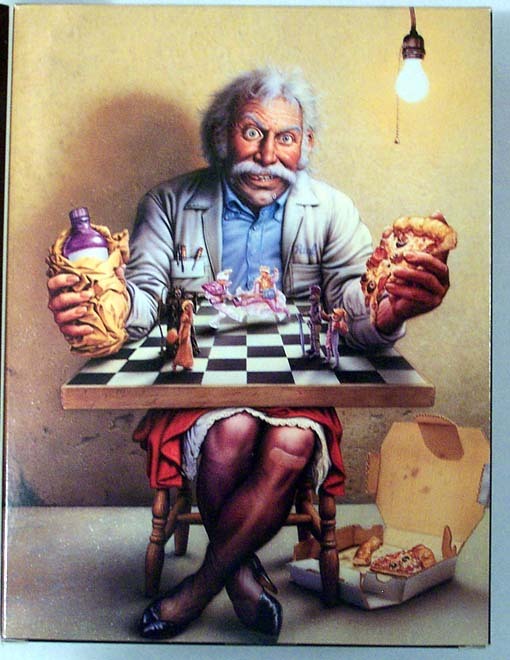 Finally, he made his appearance on the cover of National Lampoon’s Chess Maniac 5 Billion and 1. Fortunately for everyone involved, and for the sake of the whole economy, the lawyer and his puppeteers forced Spectrum HoloByte to destroy the 30,000 boxes already printed, thus saving consumers across the country, and maybe even around the world, from potential confusion.